24-year-old terrorist belonging to Al-Qassam Brigades dies while working on tunnel meant for terror activity. Officials in the Gaza strip announced this morning, Tuesday, that a 24-year-old terrorist had died while working in a terror tunnel near Rafiah in southern Gaza. According to Arab media outlet reports, the terrorist belonged to the Al-Qassam Brigades, the military wing of Hamas. The report comes after two other terrorists died in separate tunnel collapses in Gaza last week. Hamas did provide details of the locations or causes of the collapses, but confirmed the two men were members of Hamas' armed wing. However, a security source told AFP one collapse was in Gaza City, while the other was near the city of Khan Yunis. Since Israel’s counterterrorism Operation Protective Edge in 2014, Hamas has been busily reconstructing its terror tunnel network breaching into Israeli territory. 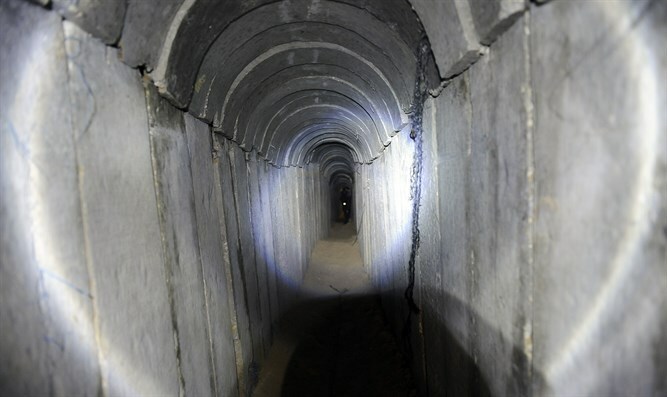 The IDF and the Israel Security Agency (ISA or Shin Bet) recently exposed significant infrastructures belonging to Hamas in Gaza, including terrorist tunnels intended to be used as hideouts for terrorists and for the transfer of weapons.